Thanks to Break.com for the pic. 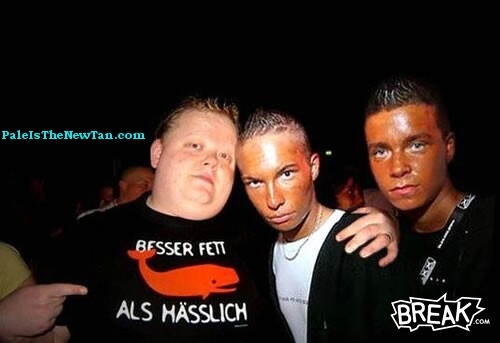 I like how you can see the total contrast of white skin to orange bronzer at the hairline of the guy in middle. The fat guy on the left has his head touching the middle kid's face.....GROSS! i think his whale shirt says, "better fat than ugly"
Pwnage by the fat kid ! Did she eat two kilograms of beta carotene? Very natural looking....like tree bark.